From construction material to pitch diameter and ratio, timing belt and pulley design requires a number of decisions to make sure you get the perfect pulley for your application. 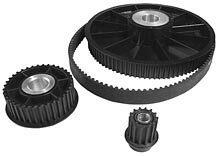 Efficient power transmission is the key to any timing pulley, and plastic timing belt pulleys can deliver efficiency without slip or backlash. Our molded synchronous drive pulleys, or timing belt pulleys, are reinforced with metal inserts to offer the lightweight advantages of nylon along with the advantages of a metal-to-metal connection at the hub. There is a wide range of standard timing pulleys available, but efficient power transmission is key to making the right design choices.